Our household goes through quite a few gallons of milk a week and if you are on a budget like we are, they you know Milk can be one of those expensive items especially since we rarely ever see coupons on it. That is why I want to share my little secret with you all it’s called your Store’s Milk Clearance Cycle! You see just about every grocery store gets truck loads of milk in and most of the time they are unable to sell all the milk in time for it to get used so some stores discount their milk up to a week ahead of time in order to get rid of it. My favorite place to find clearance milk is at Smith’s which is my local Kroger Affiliated store. 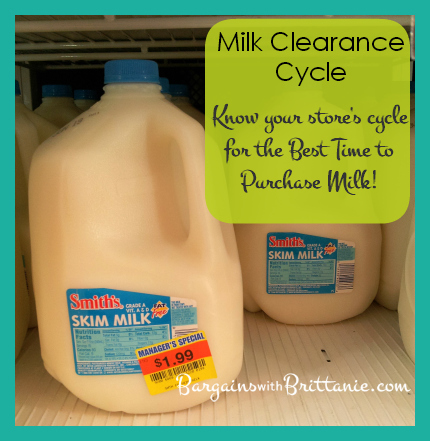 When I started finding clearance milk I noticed there was a weekly cycle. Typically I am able to find milk on clearance on Tuesday evenings before the new ad starts that next morning. I always find my milk marked down to $1.99 and it’s included the Smith’s brand milk and the Mountain Dairy brand before. Visit your local grocery store frequently (I suggest a Kroger affiliated store) and if needed, talk to a Manager and ask when milk may be marked on clearance. Check back where the milk is located. I typically find clearance milk right next to the regular priced milk (as you can see in my image above). Stock up on any clearance milk you find. You can actually even freeze milk to help it last longer. Once you figure out your store’s milk clearance cycle, visit frequently so you can avoid paying full price on milk!